Looking for custom web application development? Get state-of-the-art web app development services personalized in accordance with your business requirements, at Intelegain. Intelegain Technologies Recognised Among 20 Most Promising Enterprise Web Application Solution Providers 2016 by CIOReview Magazine. From conception to implementation our custom web application development team will guide you every step of the way. With more than a decade experience, we have honed our skills to develop solutions that surpass our clients’ goals. 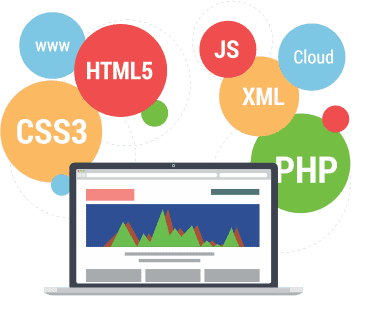 Whether it is enterprise websites and web applications, industry specific applications, online service platforms, custom web application development or off-the-shelf web app development, we have done it all. With numerous successful projects under our belt, Intelegain web application developers are well versed in creating custom products, apps and solutions that smoothly integrate with your technology and organization requirements, providing a great user experience for all your end users. Being established as a prominent custom web application development company, we provide 100% diligence in creating entirely unique and innovative web applications. Besides being user-friendly, our web applications are easy to maintain, secure and scalable. Employing our wide-ranging UI/UX and front-end skills, our developers deliver rich user experiences. We offer diverse types of web applications for web portals, e-commerce, business application, social computing- tailored to your business requirements. Be it Enterprise Resource Planning (ERP), Customer Relationship Management (CRM), Automated billing systems, Payment processing, Email marketing systems, Inventory management system, we create all. We deliver enterprise web applications that are data-centric and user-friendly and meet the strict requirements for security, administration, and maintenance. They facilitate management and enable automation of administrative duties allowing organizations to focus on their core business. Knowledge portals, enterprise web portals, market space portals and public portals etc. Our web application development services deliver external collaboration platforms that allow efficient team working with effective communication in between customers, partners and providers etc. Web applications for specific industry verticals such as legal, retail, pharma, cards and payments, human resources, travel, e-learning and financial services etc. We deliver custom web applications that are tailor-made to suit your specific business needs. Our experience in these industries makes us capable to provide unique solutions that solve industry-specific problems. These include e-commerce applications, booking applications, payment systems, online consultation platforms, social event discovery and management applications, stock trading applications etc. Our experience and competence in various online services enable us to deliver online service platforms that incorporate optimal functionality, responsive UIs and maximum performance. With more than — custom web application development projects, Intelegain is well versed in creating custom products, apps and solutions that smoothly integrate with your technology and organization requirements, providing a great user experience for all your end users. With more than 13 years of providing software solutions, we apply our experience in providing off-the-shelf software products to IT and non-IT organizations alike. Why choose Intelegain web app development services?